eCite - Understanding the impact of commercialization on public support for scientific research: Is it about the funding source or the organization conducting the research? Understanding the impact of commercialization on public support for scientific research: Is it about the funding source or the organization conducting the research? 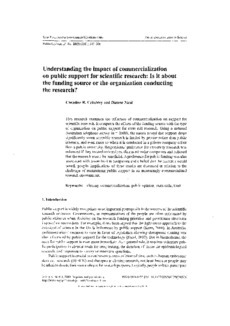 This research examines the influence of commercialization on support for scientific research. It compares the effects of the funding source with the type of organization on public support for stem cell research. Using a national Australian telephone survey (n = 1000), the results reveal that support drops significantly when scientific research is funded by private rather than public interests, and even more so when it is conducted in a private company rather than a public university. Respondents’ preference for university research was enhanced if they trusted universities, distrusted major companies and believed that the research would be beneficial. A preference for public funding was also associated with lower trust in companies and a belief that the research would benefit people. Implications of these results are discussed in relation to the challenge of maintaining public support in an increasingly commercialized research environment.